I’m happy to mail you a free paperback copy in thanks for your 5 star review comment on Amazon & Kindle. Just give me your address in a comment at the bottom of this page here on Renewal Journal. Blessings. See share to Facebook, Twitter, Linkedin, Google below. 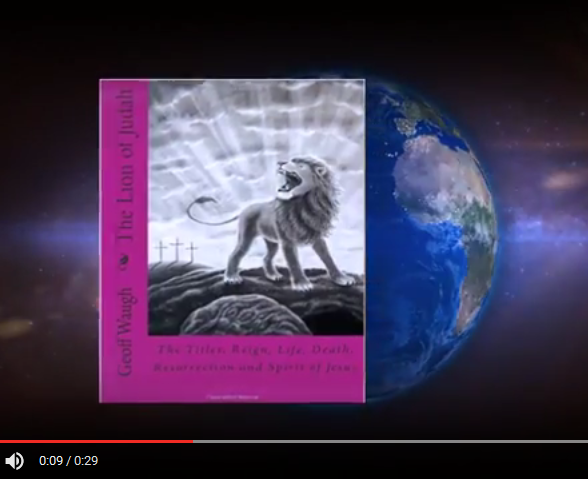 The Lion of Judah, a title adapted from Revelation 5:5, is one of the titles for Jesus. The verses in this book cover his many titles. The name Jesus is from the Greek translation of the Hebrew name Joshua (Yeshua). See www.biblegateway.com for more references using these titles. Judah’s father Jacob called him a young lion and prophesied that ‘the sceptre shall not depart from Judah until Shiloh comes’ (Genesis 49:9-10 NKJV), or ‘until he comes to whom it belongs’ (RSV), or ‘until tribute comes to him’ (NRSV, ESV). Revelation 5:5 declares that the Lion of the tribe of Judah has triumphed, announcing that Jesus, the sacrificial Lamb was also the conquering Lion. The word Joshua/Jesus means the Lord saves, or the Lord is salvation. That is why the angel announcing his birth said, ‘… you are to name him Joshua/Jesus, for he will save his people from their sins’ (Matthew 1:21). It is the same name as Moses’ general, Joshua, who led the Israelites into their promised land. The earliest English translations of the Bible used the name Jesus for Joshua/Jesus of Nazareth, and the name Joshua for others with that same name. It is translated as Joshua in Luke 3:29 (Jose in KJV), Acts 7:45 and Hebrews 4:8. So in English the name Jesus became unique and sacred for Jesus of Nazareth, the Son of God, the Saviour of the world. Joshua (originally ‘Yehoshua’ in Hebrew) had been shortened to Yeshua in Jesus’ time, so Jesus was known as Yeshua/Joshua. That name became Iesous in Greek, Yesu in Africa and Asia, Isa in Arabic, and both Joshua and Jesus in English. The Hebrew word was translated as Joshua in English and the Greek translation of that name became both Joshua and Jesus in English. Here are sample passages about Joshua/Jesus of Nazareth. You can respond to him as you read about him. He said, “I am with you always” (Matthew 28:20). Jesus, one with God, uses God’s name given to Moses at the burning bush – ‘I am’ (Exodus 3:14). The verses here expound many facets of who Jesus is in himself. I am the Alpha and the Omega, the first and the last, the beginning and the end. (Revelation 22:13; see Revelation 1:8, 11; 22:13). This book examines how Jesus, the Lion of Judah, fulfilled prophecies about him in the Scriptures.